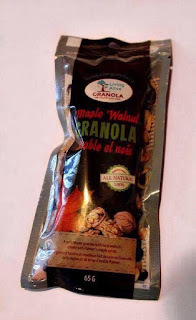 I always like to carry individual snacks in my purse or laptop bag because you never know when you or a member of your family will be hungry while you are all out and about or traveling so I was happy to review Living Alive Granola. Living Alive Granola is a Canadian company based in St. Thomas, Ontario . Local musician Stephanie Brown and longtime politician Joe Preston are busy in their St. Thomas kitchen baking fresh granola for all their customers every single week. How did this all come about? It’s a story about love for your kids, healthy living, supporting local farmers and the love of great tasting nutritious food! Both my husband and I tried the Honey Almond granola first. He first added a bit to his cereal one morning and he ate the rest at work before lunch. He isn't big on granola but he said he very much enjoyed it. I had an individual snack pack right after my daily walk. I enjoyed this one. I found it sweet and chewy and it was filling enough that I didn't feel like I needed to grab something else to eat. On another day I was out shopping and I was hungry. I didn't want to go grab anything at a fast- food restaurant but then I remembered I had a pack of the Maple Walnut granola so I eat that. Just like the honey almond granola, this was chewy, yummy and filling. If you want to purchase Living Alive Granola, it is available in some stores. Head over to their site and you can see if a store near you carries their products or you can purchase online at their site. Stephanie Brown and Joe Preston of Living Alive Granola are advocates for helping local mental health programs. #livingalivegranola pledges 10 cents from every bag sold. I am all for supporting mental health programs.